1 World Trade Center officially became the tallest building in New York City this afternoon when workers placed a steel beam on the 100th floor. 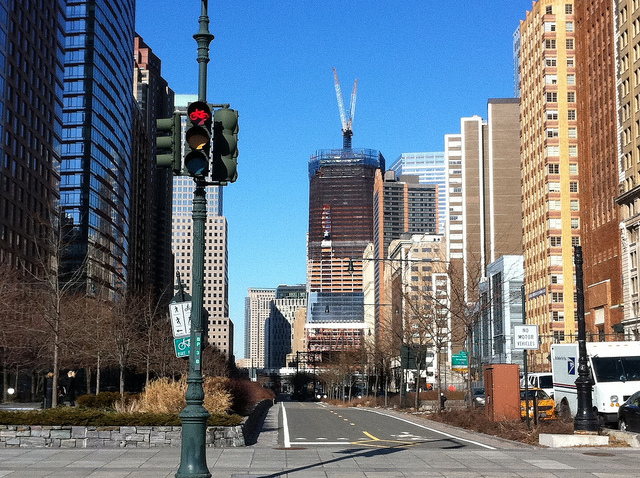 1 WTC reached 1,271 feet, surpassing the height of the iconic Empire State Building. In a gracious gesture, the latter building will be lit up tonight in red, white, and blue to honor this special skyscraper moment. 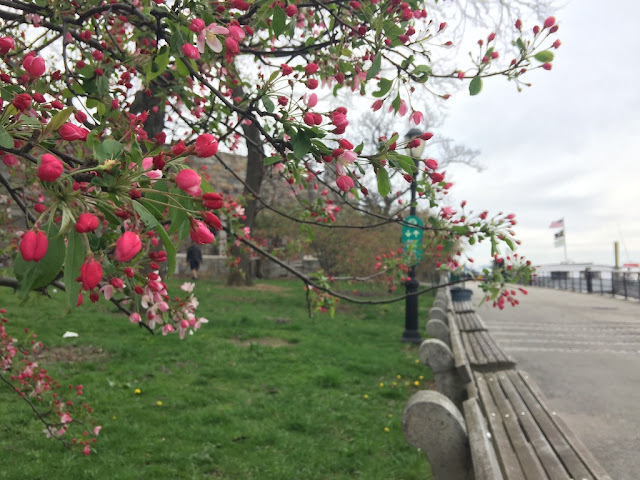 This look back in pictures from Walking Off the Big Apple charts the growth of 1 WTC through months, seasons, perspectives, and varying weather conditions. October 25, 2010. From Liberty Island. 1 WTC is not visible. January 26, 2011. Closeup during a snowstorm. February 23, 2011. From the Battery. After a delayed start of the entire World Trade Center project, 1 WTC gradually seeped into the visual identity of the downtown Manhattan skyline over the last year and a half. In the fall of 2010, the rising 1 WTC could not even be discerned in the skyline, as nearby buildings such as One Chase Manhattan Plaza (60 floors), AIG Building (66 floors), and 60 Wall Street (55 floors) obstructed views. 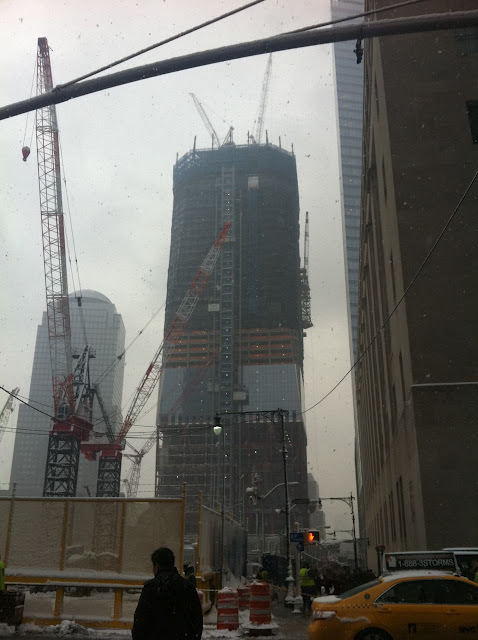 By the middle of December 2010, 1 WTC had reached the halfway point at 52 floors. On the evening this picture was taken, President Obama announced that a small team of US forces had killed Osama bin Laden, the Al Qaeda leader who directed the 911 attacks, in his heavily fortified compound in Pakistan. Following the announcement, over a thousand people gathered near the building at Vesey St. and Church St.
June 3, 2011. 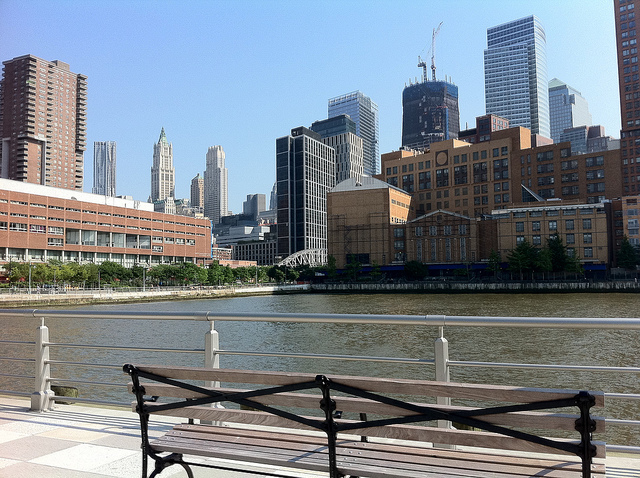 From Hudson River pier, Tribeca section. 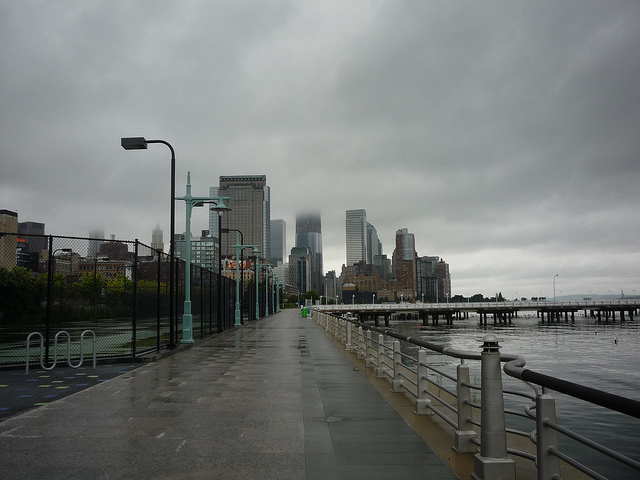 Even then, the building did not begin to register much of a presence in the skyline until the late summer of 2011, around the time NYC had a brush with a hurricane. 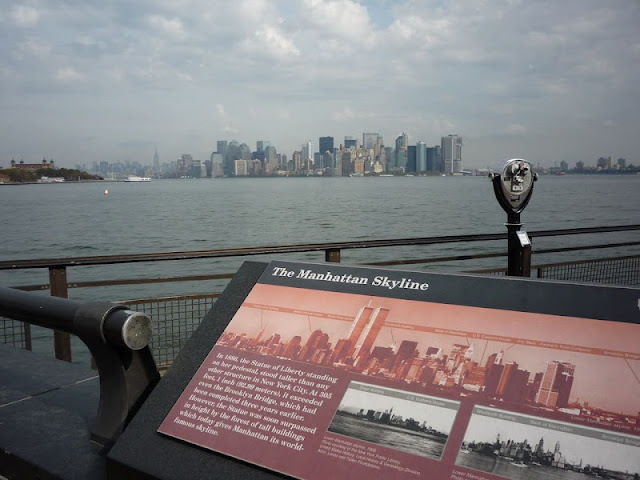 By the 10th anniversary of September 11, however, 1 WTC had clearly established its profile not just in Lower Manhattan but throughout many vantage points across the city. August 27, 2011. 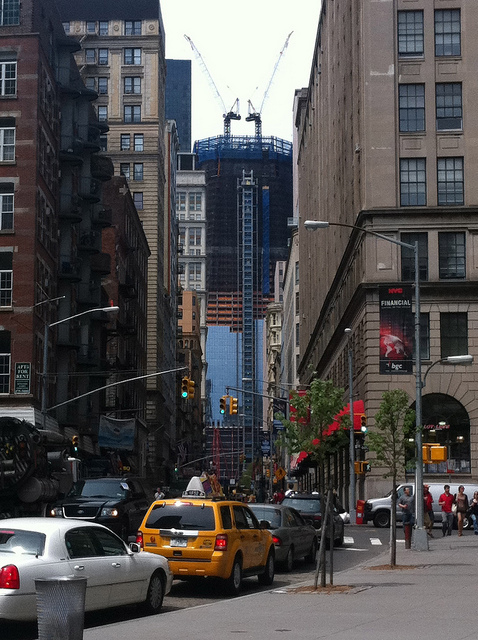 NYC was busy with Hurricane Irene preparations. September 10, 2011. 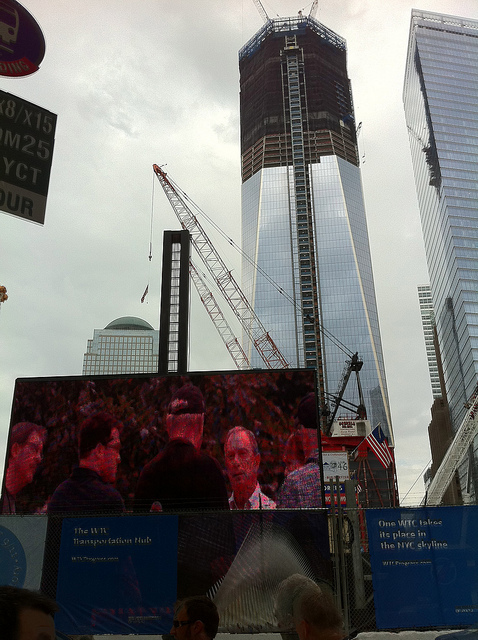 The large screen shows Mayor Bloomberg rehearsing for the next day's 10th anniversary ceremonies and the dedication of the 9/11 Memorial. 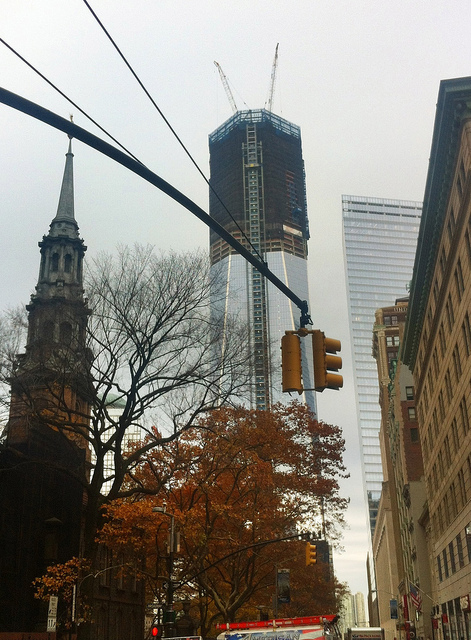 1 WTC rising behind St. Paul's Chapel, left in foreground. 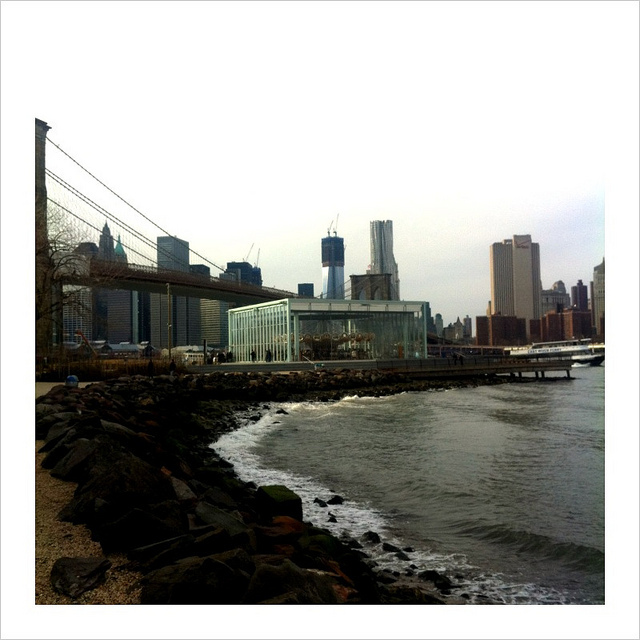 View from Brooklyn Bridge Park, with carousel in foreground. The skyscraper to the right of 1 WTC is Frank Gehry's 8 Spruce Street. Of course, a picture from today would be an appropriate ending. 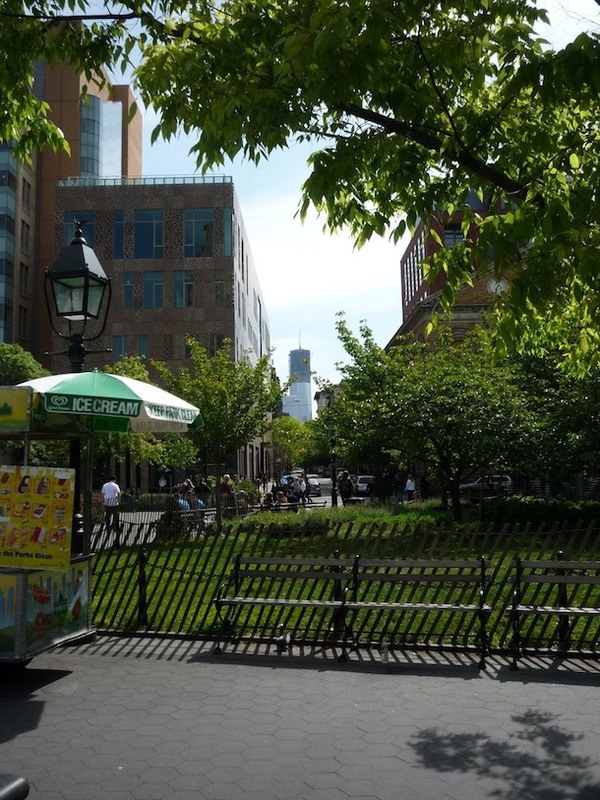 Here it is, the tallest building in New York City - a clear view from Washington Square Park. 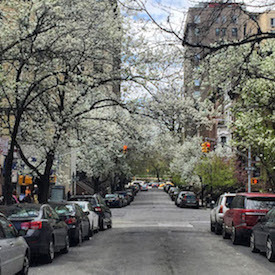 All images by Walking Off the Big Apple.